Where is the money earned? At the box office! 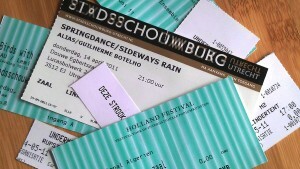 Visitors buy tickets for events, exhibitions, performances or concerts. And nowadays you will not find an amiable employee behind a cashbox with a notebook. Instead, they sit behind the computer, ask for the postal code and house number, enter the number of tickets, click Print and make payment. Whether it is online or at the box office, in cash or by bank transfer, all sales run through the same computer program. The biggest challenge for a ticket sales system is that not only the box office uses it. The programmer wants to examine the proceeds per performance and to make objective-based analyses. The marketing department wants to know who the visitors are and to select visitors with certain characteristics, in order to contact them or not. The accountant wants annual figures that tally and the assurance that tickets are sold as permitted, the fundraiser wants to find potential donors, and the visitor is concerned about privacy. Donation details and loyalty programmes. A well-implemented ticket sales program not only provides insight into the number of tickets sold per event or season, but also outlines a clear image of the visitor. It is a complete toolbox for engaging the customer.